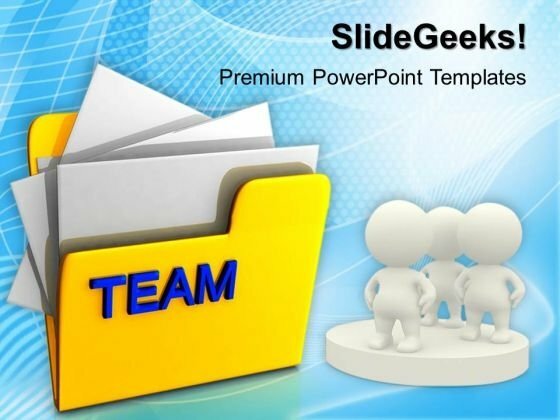 Computer Folder With Team PowerPoint Templates And PowerPoint Themes 1012-This PowerPoint Template Shows the group of people standing as team besides the Team Folders consisting of all documents required in the process. It signifies the concept of how the team works in a united way and impartially. Use this Template to Enhance your presentations and spread the concept of team work.-Computer Folder With Team PowerPoint Templates And PowerPoint Themes 1012-This PowerPoint template can be used for presentations relating to-"Folder with inscription team, teamwork, people, computer, business, communication" Advise teams with our Computer Folder With Team PowerPoint Templates And PowerPoint Themes 1012. You will come out on top. Our Computer Folder With Team PowerPoint Templates And PowerPoint Themes 1012 are associated with ambition. They encourage you to dream big.